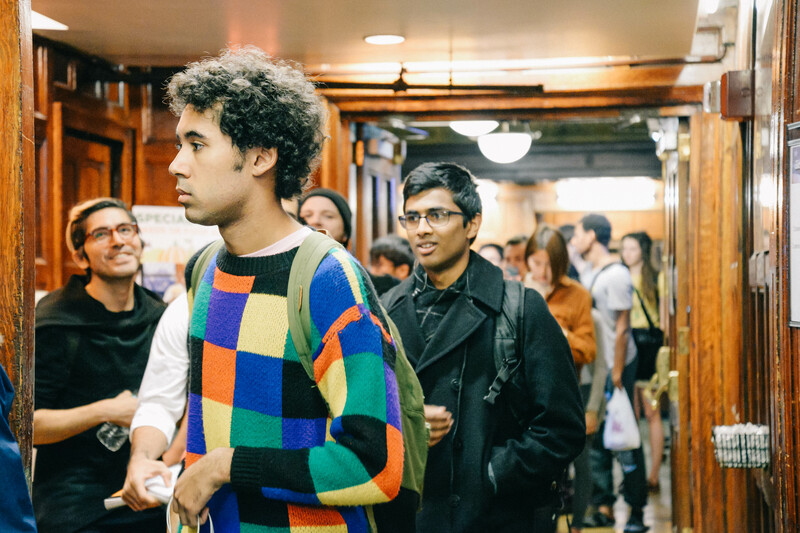 In Spring 2019, we packed over 300 current and former 3157 students in John Jay – so many we've outgrown the space! 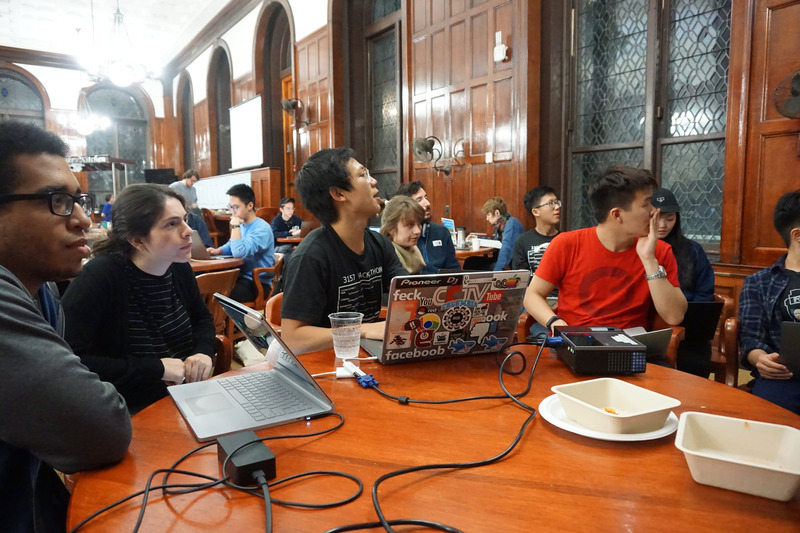 While students ate and hacked, TAs gave workshops on Vim, Makefiles, Git, and APIs. To top it all off, we kicked off our first ever AP Puzzle Hunt! 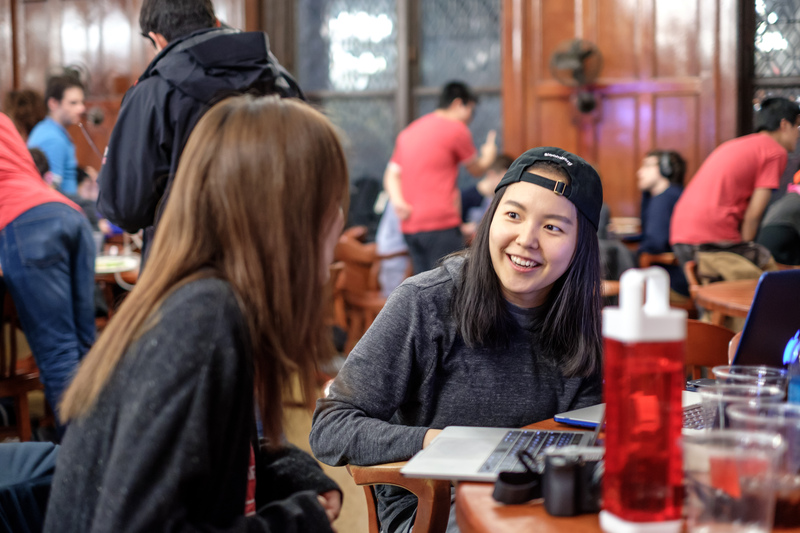 You can see more photos of the Spring 2019 hackathon here. 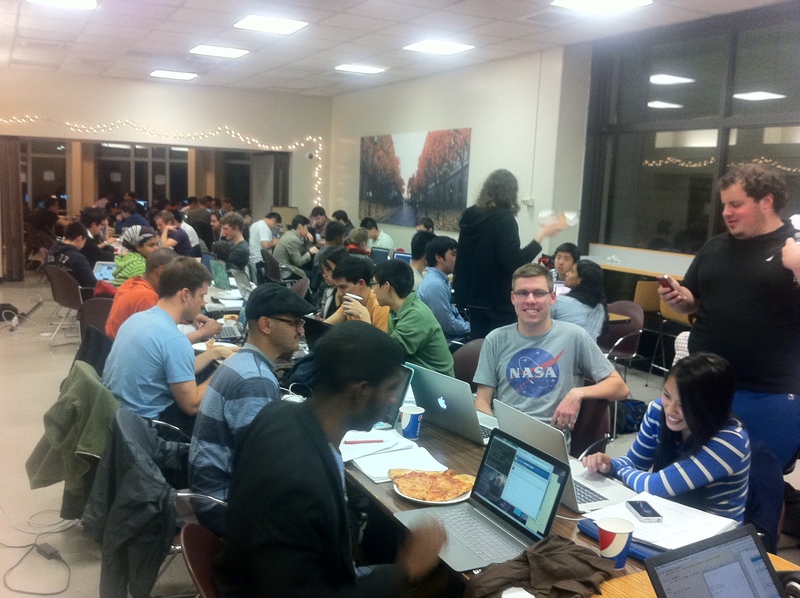 The 3157 Hackathon is an optional hackathon intended for students and alumni of the 3157. 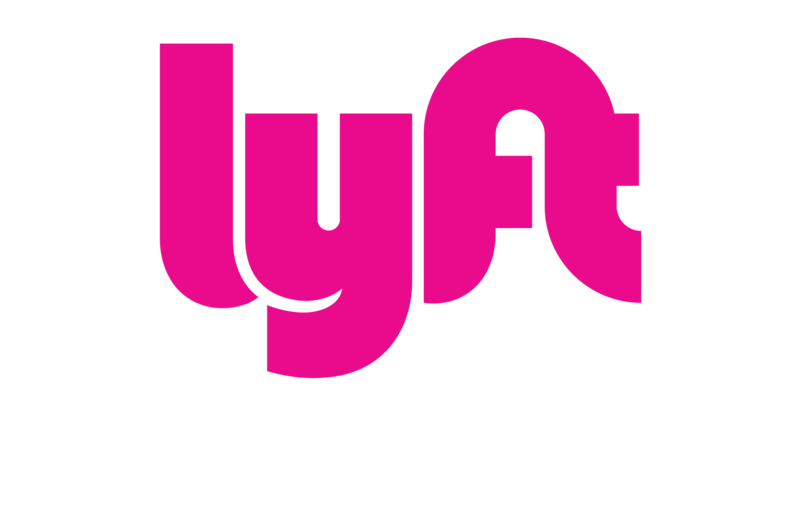 As well as awesome people, we'll also have snacks and drinks to keep you fueled all night, 3157 swag, and swag from our sponsors! 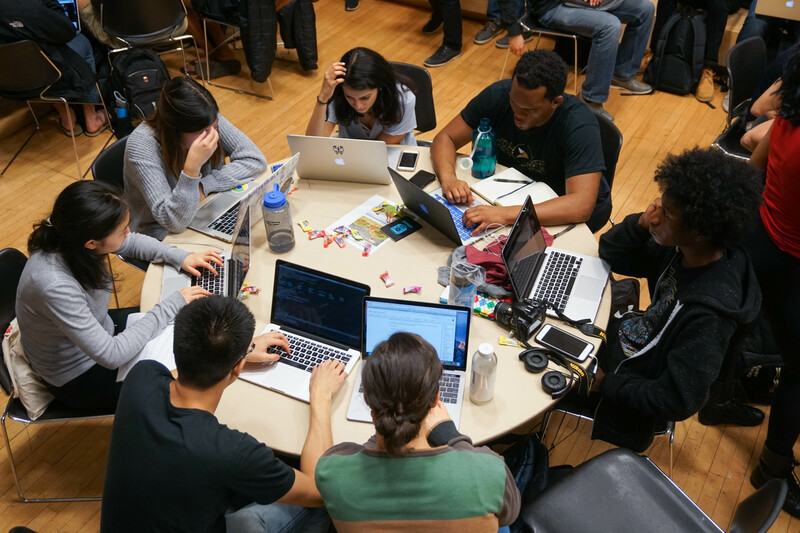 This hackathon isn't just for homework, it's also an open learning environment. 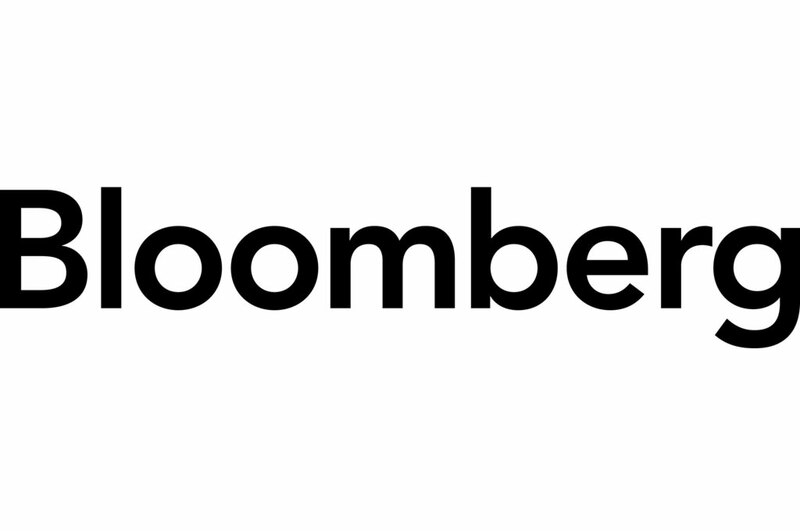 Whether you're a hackathon veteran or a first-timer, stop by. 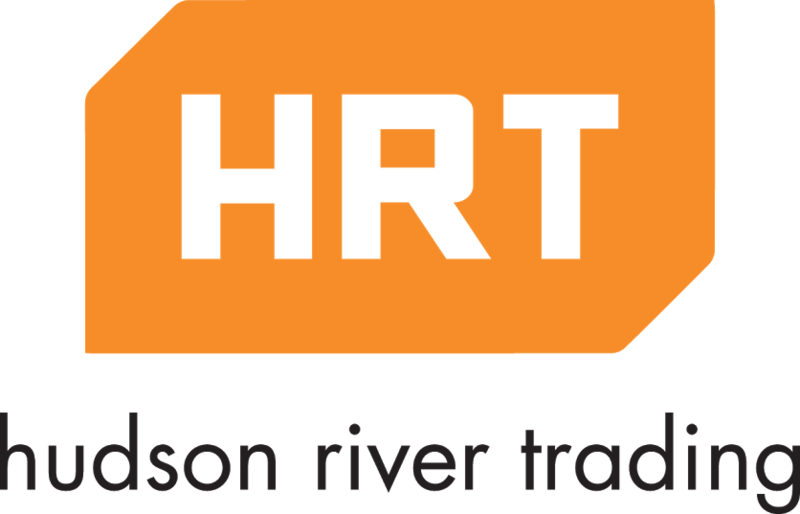 Hackathon! 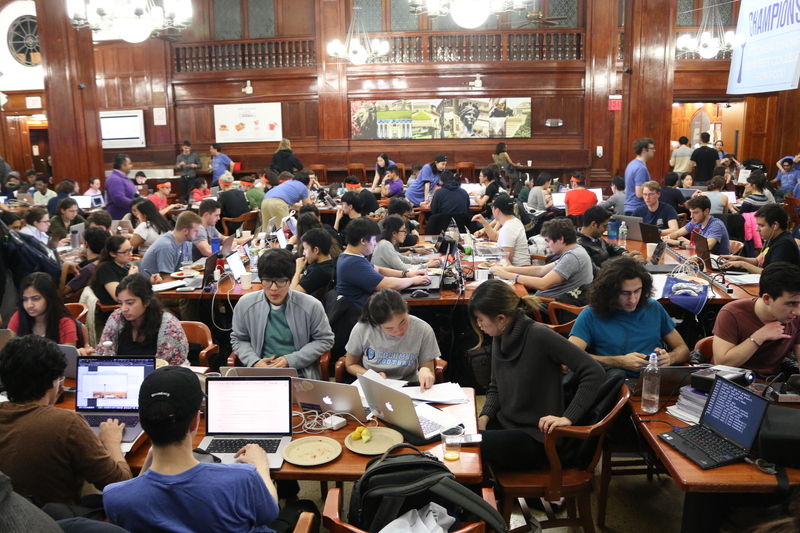 On Friday, March 8th, from 7:30pm to 2am students will be working in John Jay dining hall on a major assignment: lab4. 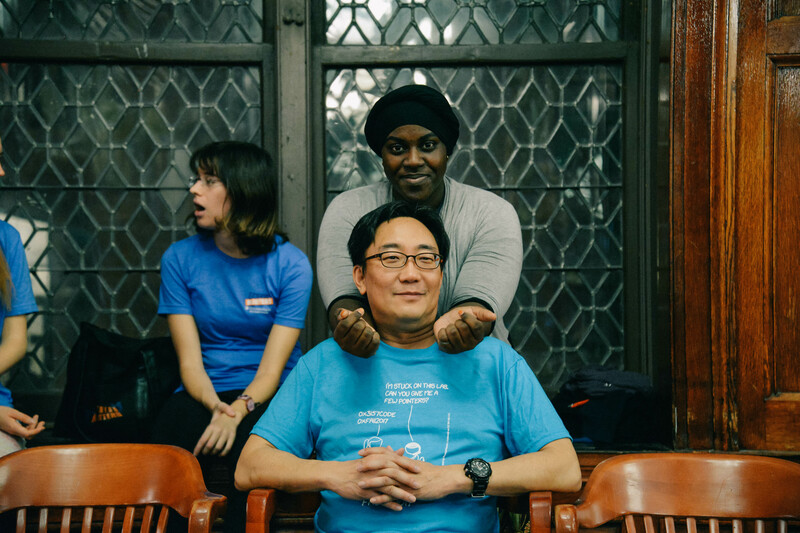 Alumni and TAs will be around to help, too. ​There is no demo, there is no judging, and there is no prize. 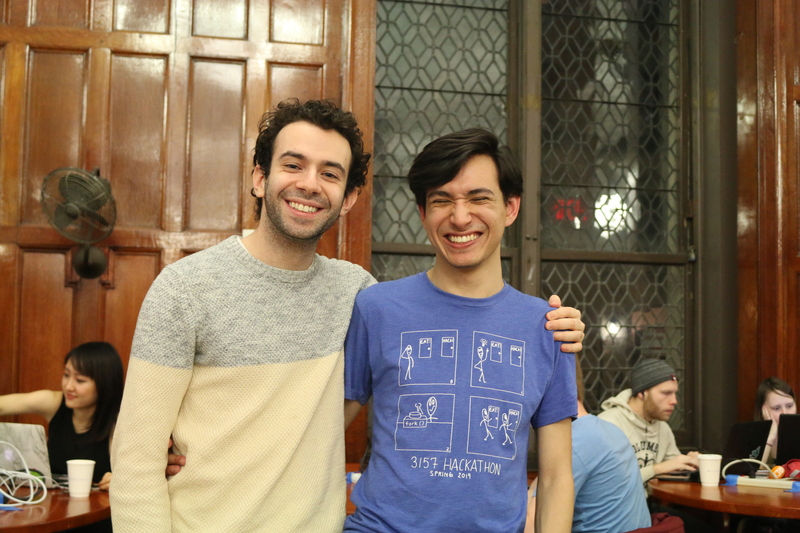 Just a night of hacking, good food, laughter, and friendship. 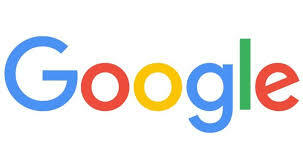 Feel good about asking for help and helping others. No showing off and no embarrassment. 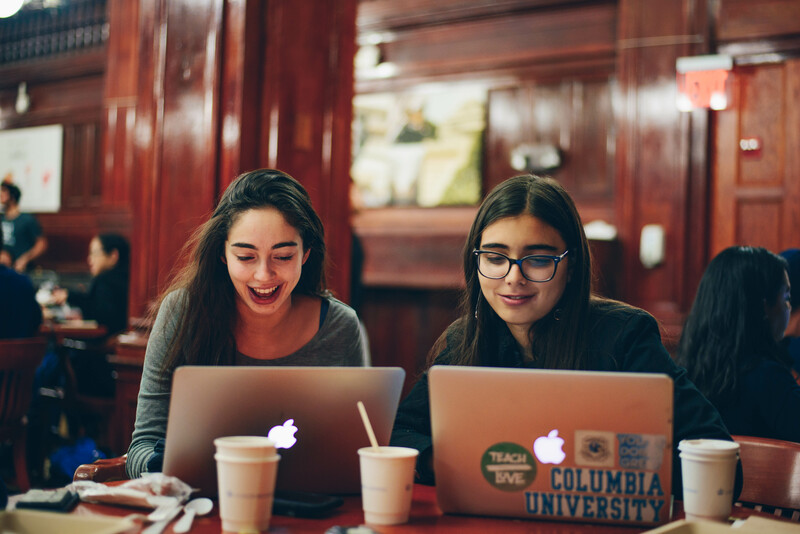 We are very proud that for Columbia CS students new to hackathons, their first experience is one of cooperation and friendship, not of competition. 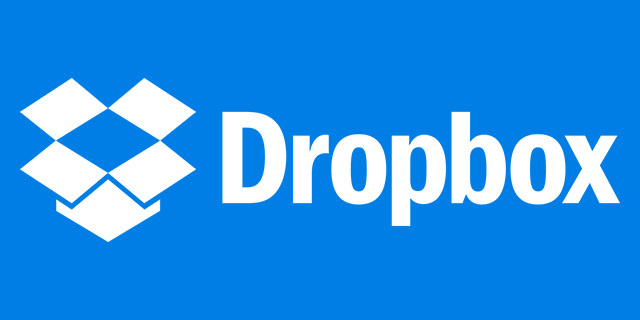 Show up to get work done on your labs, to get help, or to help your classmates. 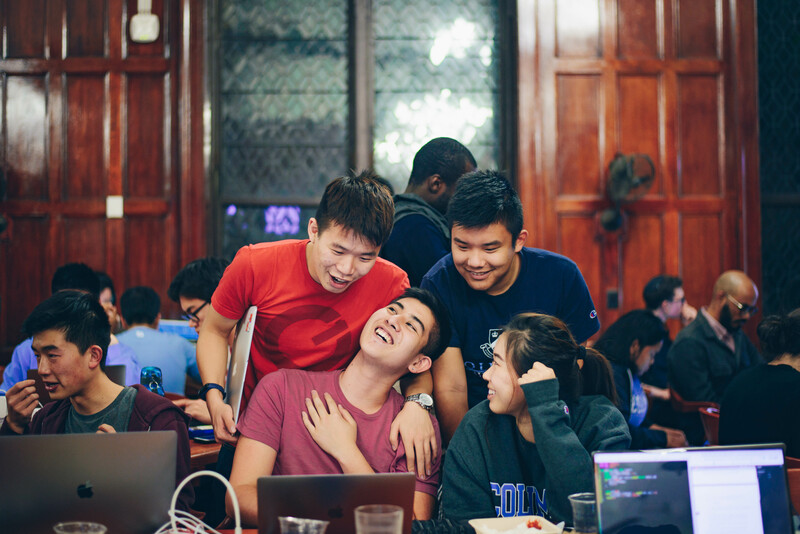 Come and help out current students (while also hacking on your own projects)! Hang out, eat free food, talk, listen, learn, laugh, and sleep. Attendance is not required. It&apos;s completely optional. It&apos;s totally understandable if you have better things to do weekend night than geeking out all night. If you come, you don&apos;t have to stay all night. You're free to come and go as you please. In addition to a good attitude, please bring a charged laptop, its charger, and your CUID. 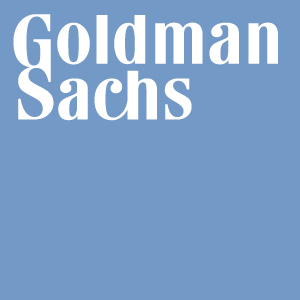 During the hackathon, we will have a very loose collaboration policy. You can look at your classmates&apos; code to learn or to help. You can sit down with someone else and try things together. All we ask is for you to make a genuine effort to learn or to help. 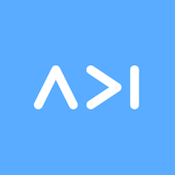 You should list the people you have collaborated with in your README. Luckily, we will be situated just one floor above JJ's dining hall! They will be catering some of our favorite late night snacks. Expect sandwiches, fries, chicken wings, fruit, salad, veggies, and at midnight, a sweet surprise! 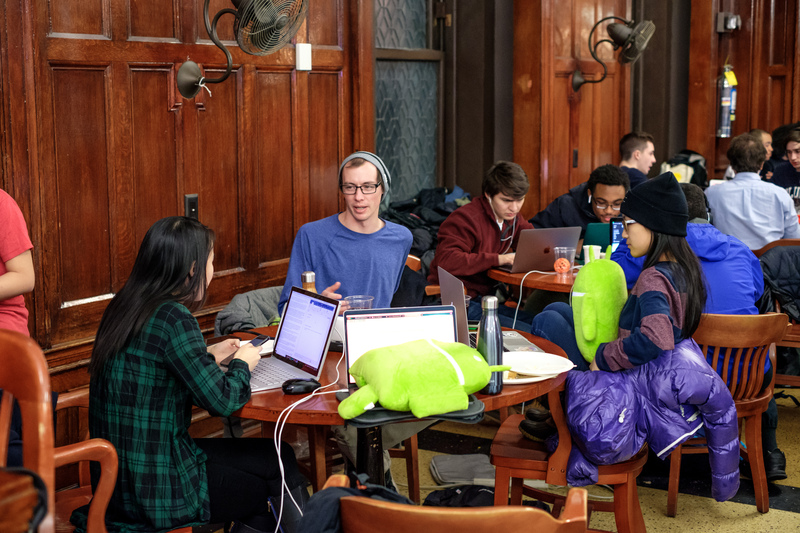 The hackathon would also be a great opportunity for you to learn from your savvy TAs and classmates about some of the extra stuff that will enrich your shell experience—nifty vim, emacs, .bashrc, and VirtualBox configurations, useful debugging tools and techniques, handy UNIX hacks, etc. Glad to hear it. RSVP here. We'll see you there! 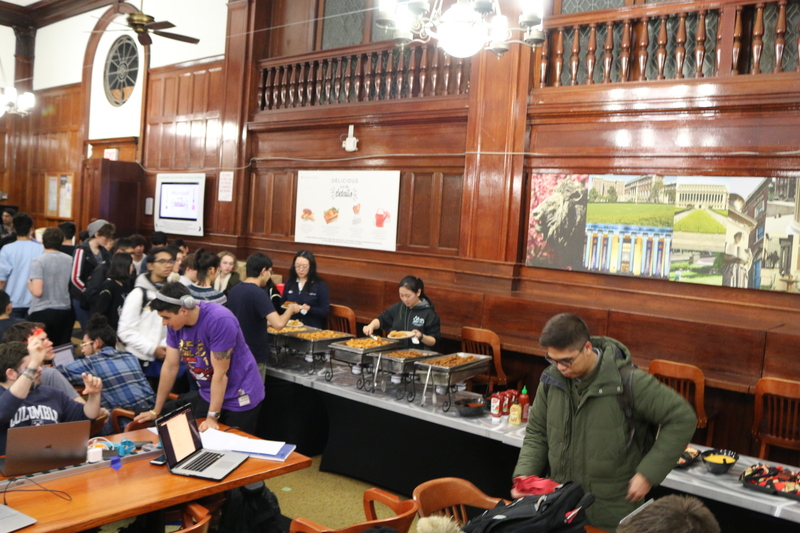 At our Fall 2018 Hackathon, we had nearly 300 APers join us at John Jay to work on assignments, have a good time, and eat some good food! 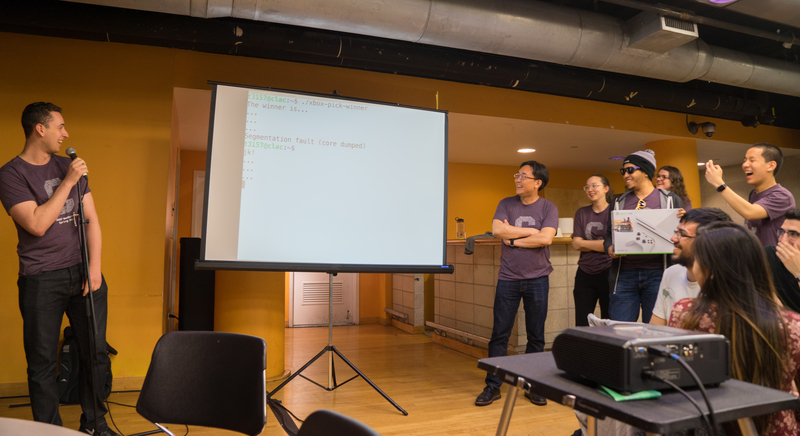 Throughout the night, the TAs gave tech talks on GDB, bash, and git. 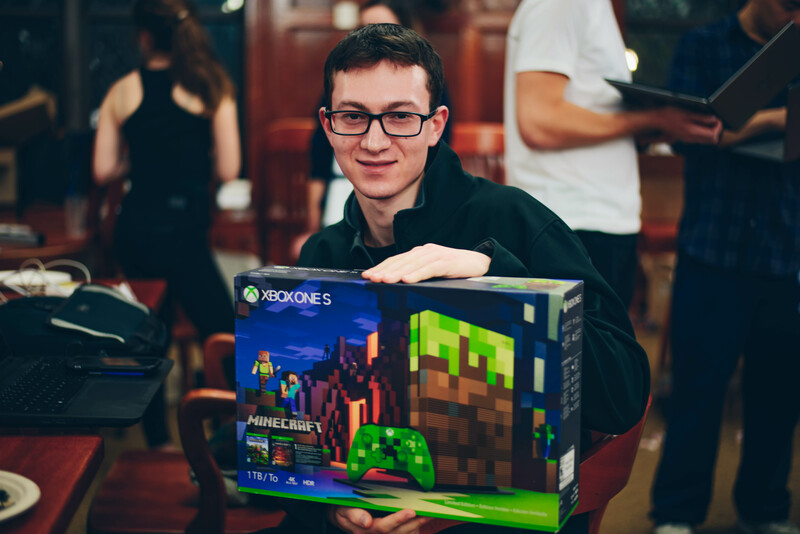 We even raffled off a Xbox-One for the midnight surprise! Check out more photos here. 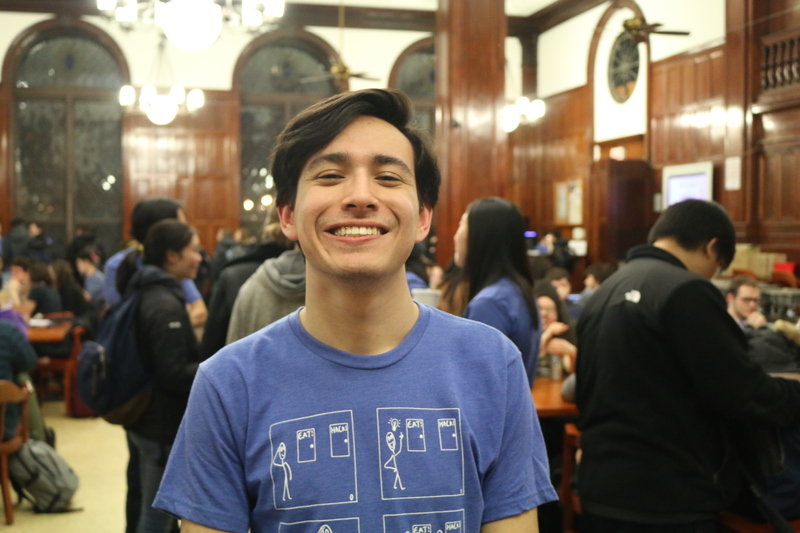 We celebrated our 1010th anniversary of the Spring 2018 Hackathon in John Jay Dining Hall! 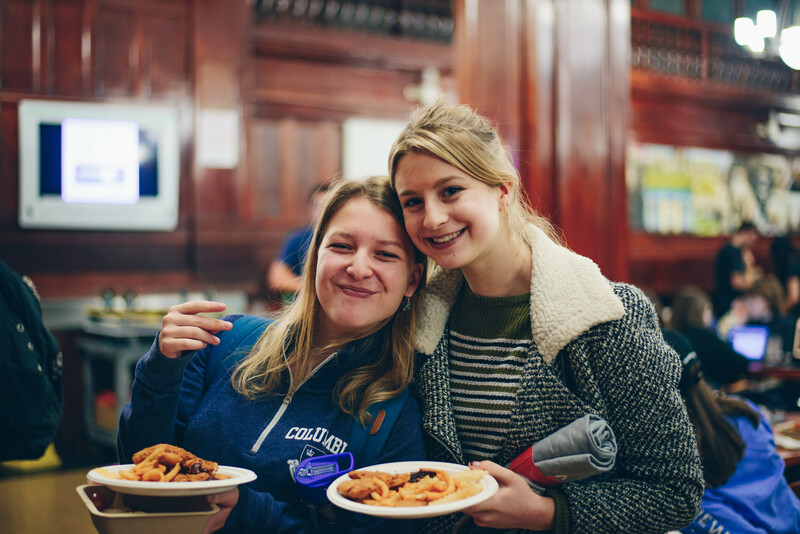 Hundreds of APers and alumni joined us for a night of snacks, swag, and fun! 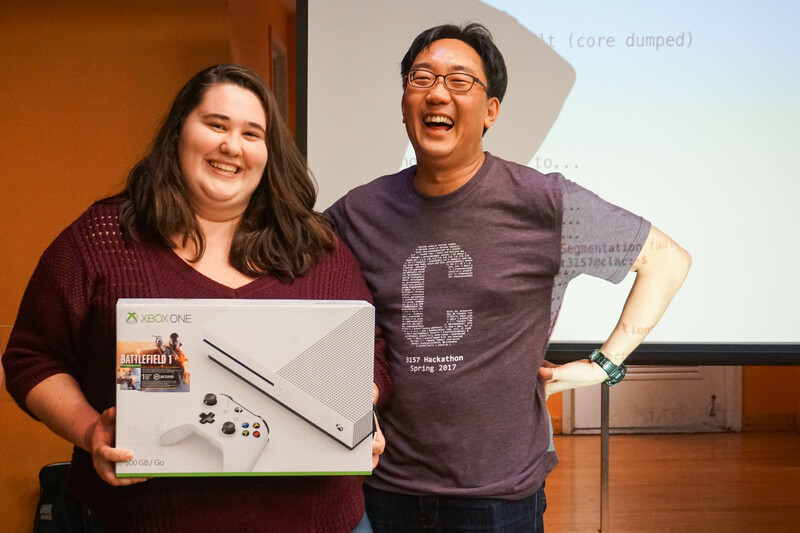 We raffled off two Amazon Echo Dots and a Xbox-One! Check out more photos here. 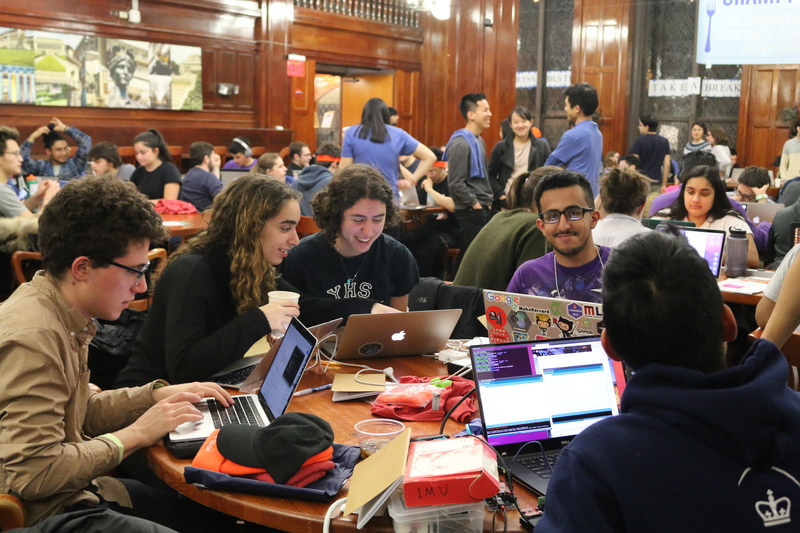 At our Fall 2017 Hackathon, around 300 APers went back to John Jay to hack away at their homework and free food. 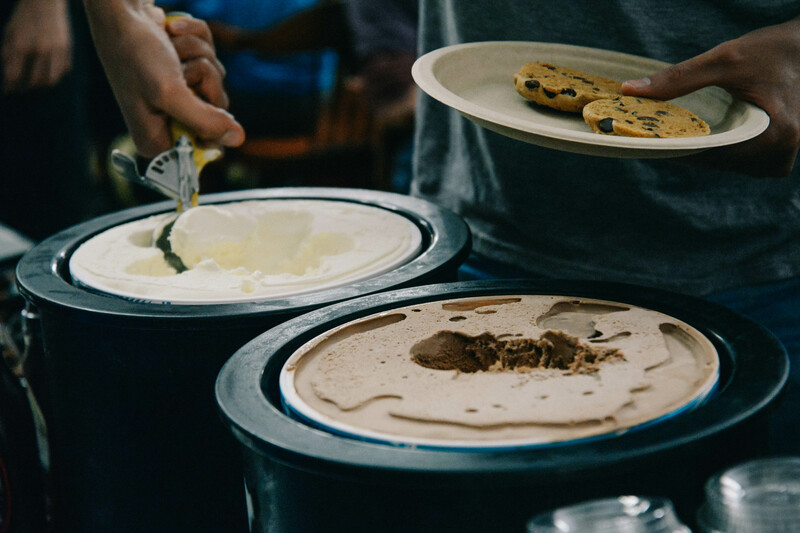 We were joined by Stressbusters to help ease any tension, and our hackers were surprised at midnight with ice cream and cookies! Check out more photos here. 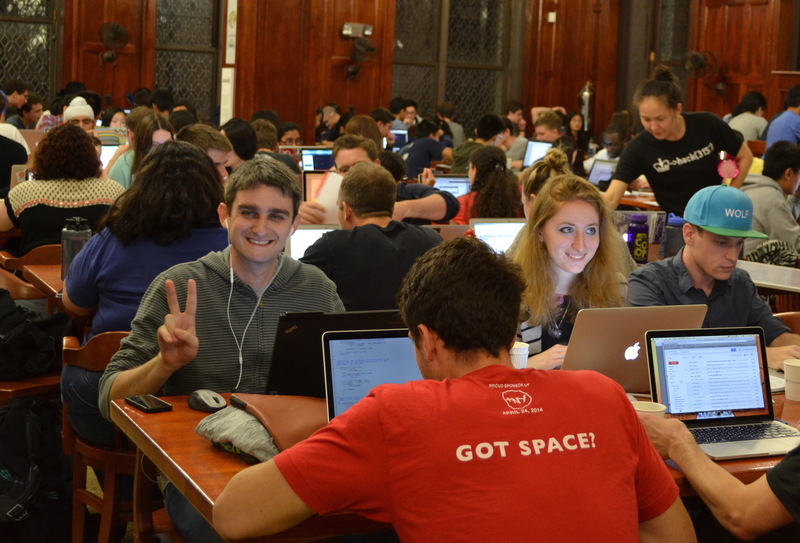 At our Spring 2017 Hackathon, we had 220+ Hackers join us in Lerner Party Space to work on Lab 4. 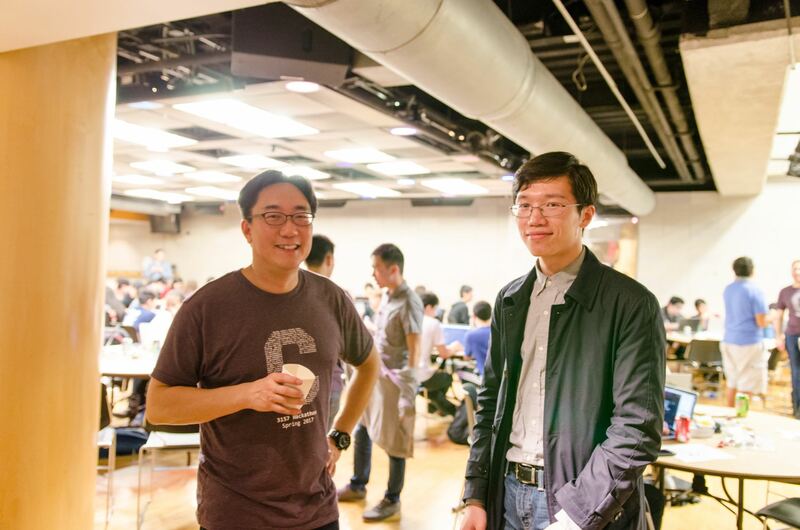 Swag, food and company made this hackathon as successful as any. 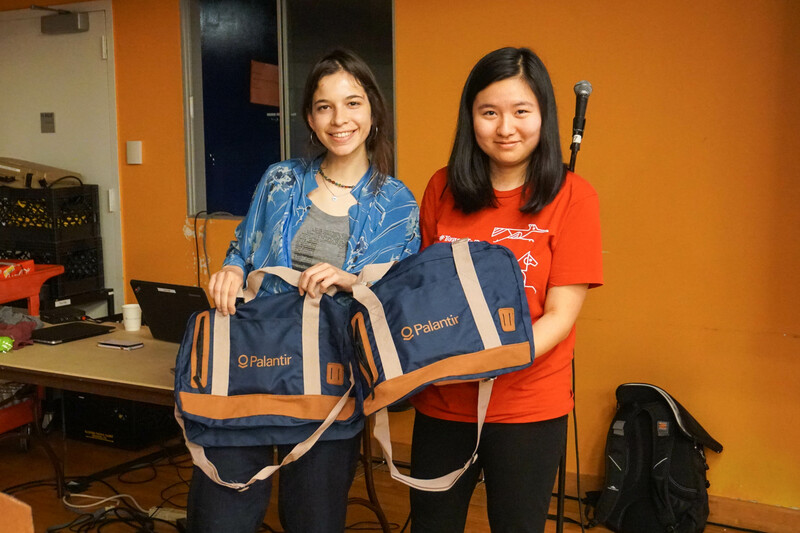 Upping the ante, our midnight surprise included a raffle for Palantir duffel bags and an Xbox One! No segmentation fault could keep us at bay. See more photos here. 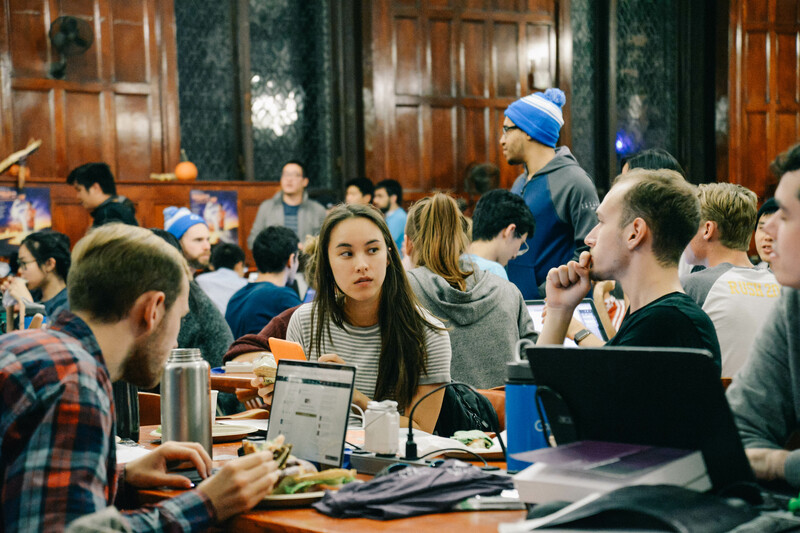 At our Fall 2016 Hackathon over 300 hackers joined us in Roone Arledge Auditorium to work on Lab 3, collect swag, eat food, and witness the unveiling of the midnight surprise—Insomnia cookies! Check out some pictures! 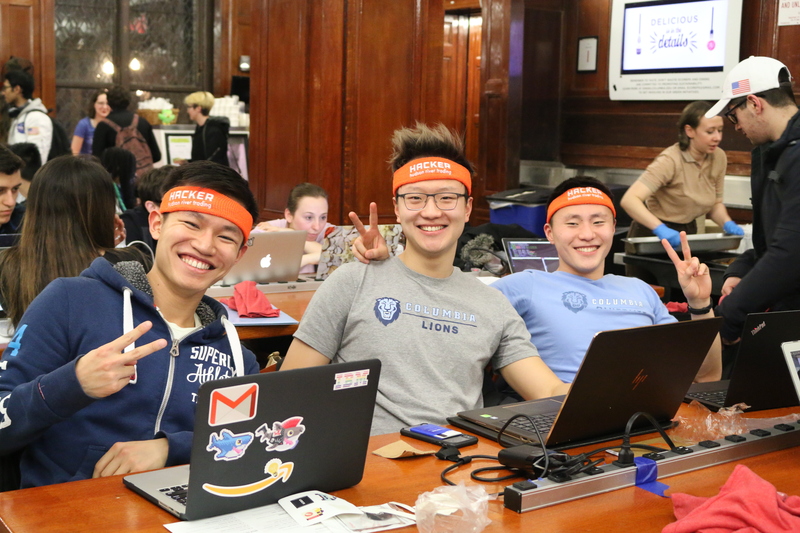 At our Spring 2016 Hackathon we again packed 300+ hackers into Roone Arledge Auditorium. 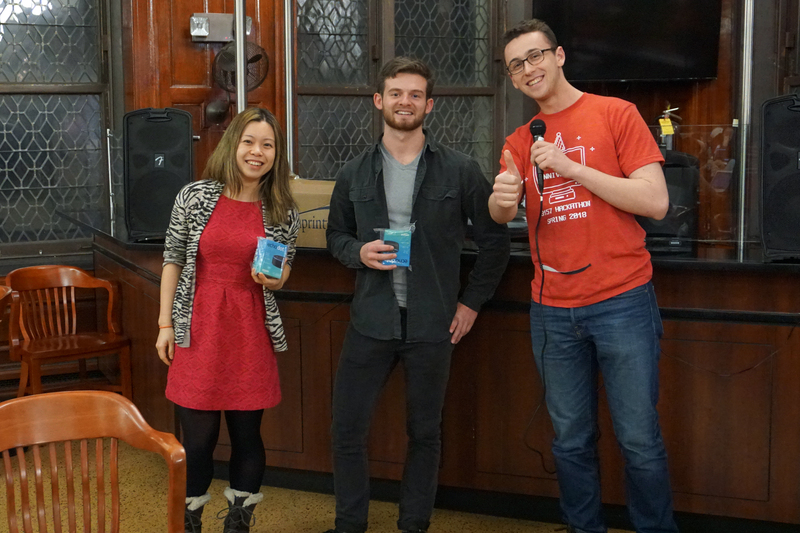 New sponsors for swag and food (and pancakes) made it one of the best nights yet! Check out photos here. 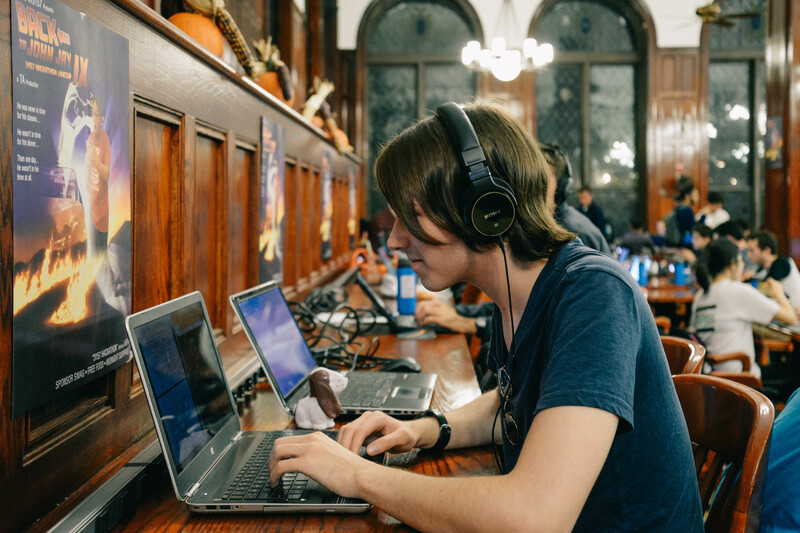 At our Fall 2015 Hackathon attendance broke 300 in our new venue, the Roone Arledge Auditorium. 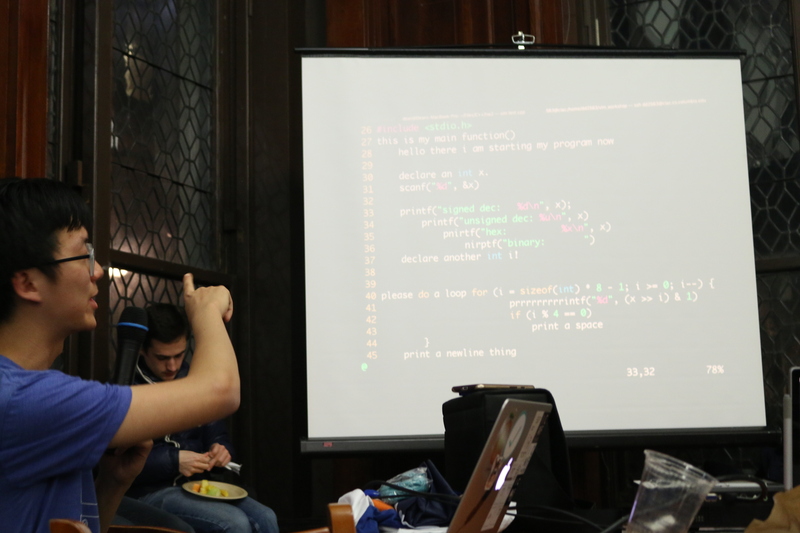 Along with new digs came upgrades in food, swag, and educational info sessions on coding practice. Check out photos here. 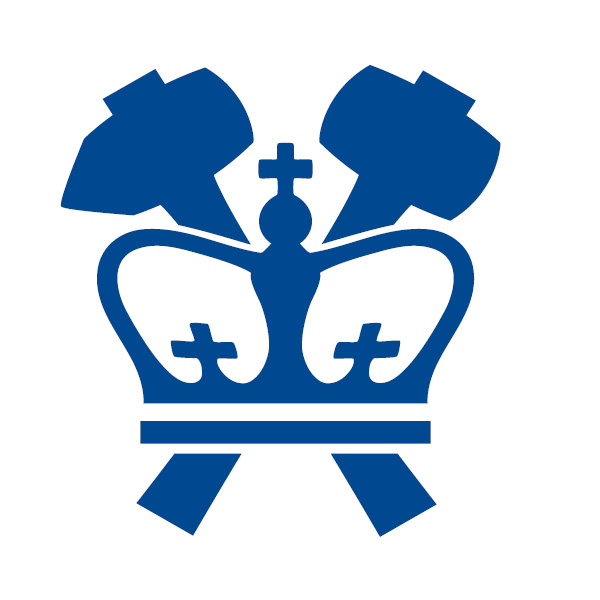 In Spring 2015, we packed over 230 current and former 3157 students in John Jay. 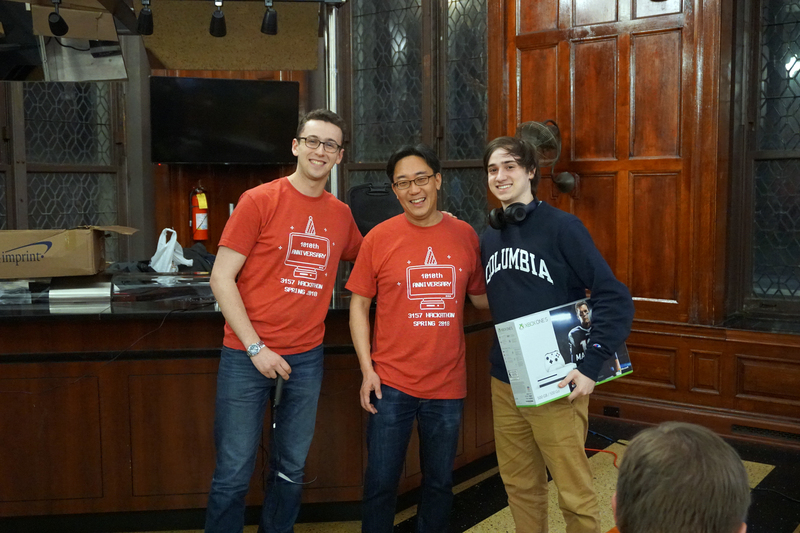 You can see more photos of the Spring 2015 hackathon here. 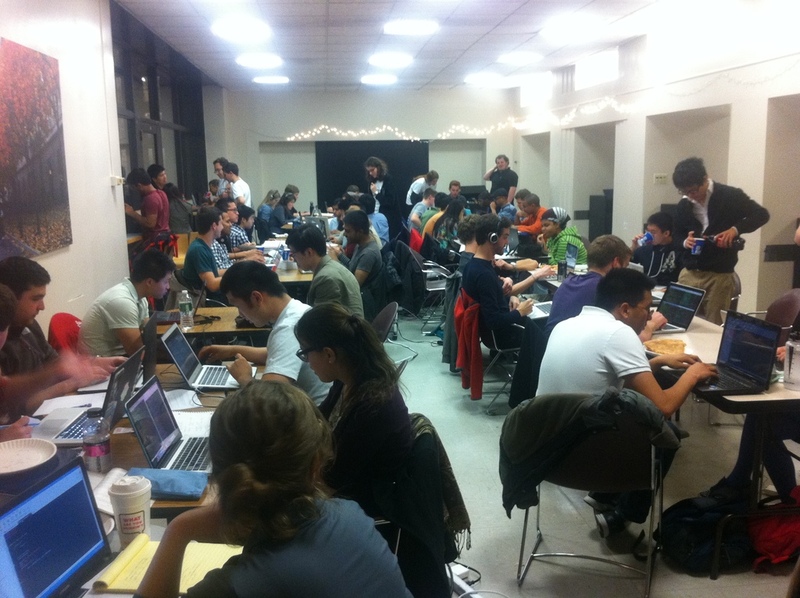 In Fall 2014 we had over 200 current and former 3157 students hacking in John Jay. 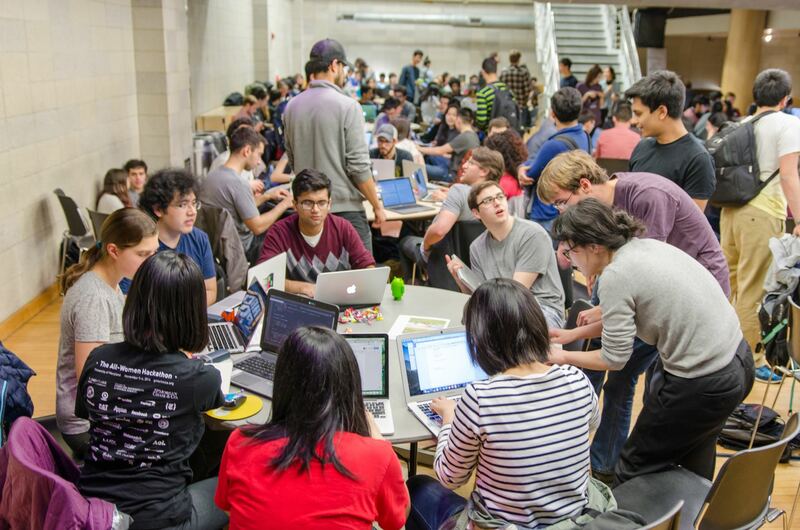 In Spring 2014 we had over 160 current and former 3157 students hacking in John Jay. 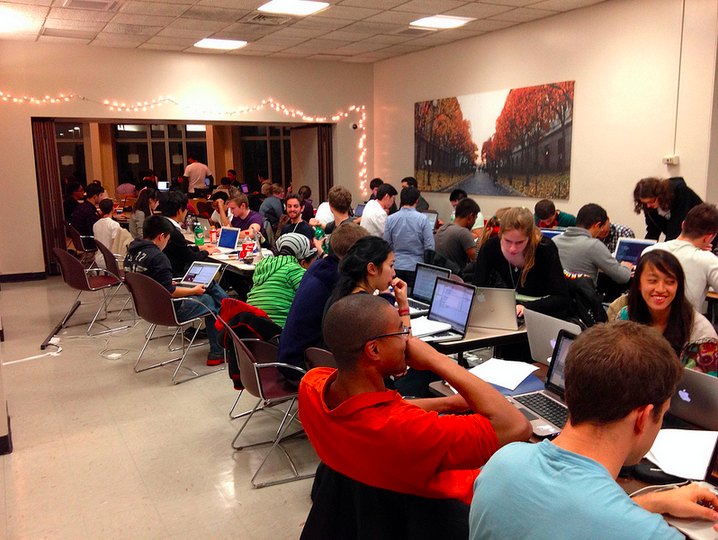 In Fall 2013 we had over 100 current and former 3157 students hacking in Carleton Lounge. 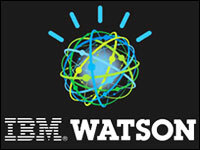 3157 Hackathon: Code early, code often. You are a flower.